Despite negative sentiments and protests against military rule, Ahmed Shafiq has consistently been the subject of social media engagement in volume two and three times more than his opponents. However, Morsy’s high percentage of positive sentiment also indicates a strong base of supporters. The television debate on 10 May 2012 seemed to be a turning point for the liberal versus conservative camps. 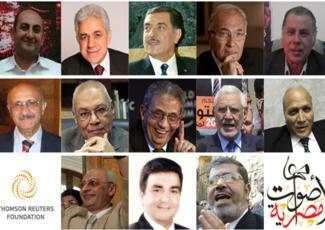 On the liberal camp we saw the sudden rise of Hamdeen Sabbahi from the Nasserite party. The conservatives stayed conservative and out of the limelight during controversial debate. Twitter talk on Morsy, in particular, became quiet after the debates. There is a fleeting aspect to this type of ambient journalism. It has a great impact on mobilizing and alerting around real-time events. However, the trends can change at a dizzying rate. Arabic language dominates Twitter posts on hashtags related to Egypt. In the case of hashtag #Egypt, the candidates trend differently when their names are posted in Arabic than when they are posted in English. The candidates that will advance to the next round, Ahmed Shafiq and Mohamed Morsy, both had very little Twitter discussion about them in English. The candidates that appeared most in the Arabic tweets are the two that won this first round. From this social media data, it was clear that Shafiq was “leading the Twitter talk polls,” so to speak, for weeks now. He consistently stayed ahead of his opponents throughout the race. Despite the minimal social media penetration among Egyptians, in this case study, Twitter did function as an echo-chamber to events on the ground—from the violent clashes in Abassiya in early May, to the television debates on 10 May, to the shoe throwing attack on Shafiq on 23 May, all the way until the closing of the voting polls.